Imagine driving down the freeway…you see a billboard with a message about an accountant specializing in international business, just what you’ve been looking for! As you start to read a few sentences at 70 mph, a giant helium-filled monkey that’s anchored in place next to the billboard begins clashing it’s synthetic cymbals while cables retract and expand it’s eyelids. 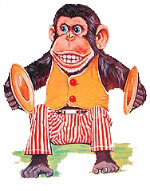 Hey look there’s some sort of logo on the monkey’s shirt for the accounting firm….too late, you’ve sped by the sign. As ridiculous as this example sounds, it’s exactly what happens many times on websites. We find a site in a Google search that looks like it might be what we’re after, but on its front page were confronted by too many snippets of ambiguous information and distractions and no clear statements of what this site is about. One of the most ludicrous distracting features that I’ve seen recently is “SitePal.” A zombie-like animated talking head that speaks in slow broken computer generated speech…”Welcome (octave lower) to our Website (two octaves higher) Please mouse over my (pause) face to make me talk. What’s even creepier is that on some versions the characters head slightly bobbles and it’s eyes cross as it attempts to follow your mouse movements. access to solid research on the topic visit the Stanford Web Credibility Research site or, in keeping with the theme of efficient communication, check out the all-time classic, Don’t Make Me Think, by Steve Krug.